Your little ball of white and brown fluff loves to splash through mud puddles every time it rains. That silky fur seems to mat and tangle even when she's standing still. And you wonder if her forehead fringe of fur didn't fall over her eyes when she ate, maybe she wouldn't manage to embed so much food around her muzzle. Establishing a regular grooming routine may not prevent your Maltese Shih Tzu from turning into a canine dust ball from time to time, but it can help her look and feel her best, from her floppy ears to the tip of her wagging tail. Maltese Shih Tzus are a relatively new crossbreed, mixing the small, white Maltese with the almost equally petite and long-furred Shih Tzu to create an adorable, energetic dog. One advantage of this Shih Tzu mix, developed in the 1990s, is that they don't shed quite as much as dogs in the Shih Tzu lineage. Maltese Shih Tzus — sometimes erroneously referred to as shitzu Maltese or Maltese shitzu, and nicknamed malshis — don't have an exact breed standard and are not recognized by the American Kennel Club yet, so there is some variance in their appearance, but all have long, white fur that takes patience to groom. A toy breed, malshi adults weigh 7 to 14 pounds and are 8 to 12 inches tall at the shoulder. All have long fur that ranges from straight to wavy. Malshis live about 12 to 14 years. Both Maltese and Shih Tzus have long histories. In fact, the Maltese have been immortalized by writers and artists back at least two millennia to the ancient Egyptians, Romans, and Greeks. They can be both lively and cuddly and may have first been bred in the Mediterranean's isle of Malta. This toy breed weighs in at just 4 to 7 pounds, which includes its profusion of silky white fur that can grow to floor length. The larger Shih Tzu traces its heritage to China and has been portrayed as the lapdog of emperors in paintings that date back to the 6th century. These dogs weigh between 9 and 16 pounds. The Maltese Shih Tzu has traits of both parents, but these so-called designer dogs have been bred to have less of the stubby nose and bulging eyes common to Shih Tzus, and its fur won't grow quite as long as a Maltese. The Maltese Shih Tzu temperament can be a bit more energetic than the Maltese and will be more tolerant of other dogs and children than the Maltese as well. Malshis are eager to play and love to please their owners. Both parent breeds are said to be hypoallergenic, but those with severe allergies to dogs may still sneeze or wheeze around them. Even if you take your Maltese Shih Tzu to a groomer for regular maintenance, you will still need to supplement professional grooming sessions with home grooming. One of the first tasks in grooming is detangling all that silky white fur. Malshi fur can range from long to, well, very long, and some owners swear it mats within minutes of brushing. The primary determining factor of just how much maintenance your malshi's coat will need is the length you keep it. If you cut the fur short, it can save on the time it takes to make her presentable each day. But, of course, the fur will grow back fast, and the cost of regular haircuts can add up quickly. If you keep your Maltese Shih Tzu's coat relatively long, daily brushing is mandatory. Once the fur gets tangles, mats can follow. A two-sided dog brush can help with both these problems. These special grooming brushes have bristles on one side and round-tipped pins on the other. As you brush your malshi, focus on areas that tend to tangle the most, such as the belly and where her collar or harness rubs the fur. If you find the brush frequently comes to a screeching halt as you try to draw it through the fur, you can try spraying a mixture of ¾ water to ¼ conditioner onto the fur before brushing. There are also many commercial detangling sprays available that can help detangle and break up the mats. Make sure to brush your malshi before bathing him. The water will only exacerbate the mats, which may end up needing to be cut out. Dogs with long hair should be bathed about twice a month, although shorter-haired malshis can go longer between baths. 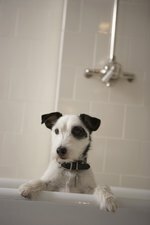 Use a conditioner formulated for dogs to help make brushing easier once he dries off. You can use a blow drier on your malshi, but make sure it's on a low, warm setting — not hot — to ensure that all that carefully washed fur doesn't blow right into new tangles. Owners won't have much trouble determining when it's time for a malshi haircut. You may just get too tired of constant brushing or finding long fur clinging to your favorite coat and most of your furniture. Trimming fur on malshis is much like trimming it on Maltese and Shih Tzus. While some owners take their dogs to groomers for this part of coat care, others, who are handy with scissors, can give it a try, perhaps after watching a video or two online. In the lowest-maintenance cut, often used for puppies or during warm summer months, the hair is cut evenly to about ½ to 2 inches all over the dog's body. An alternative to this cut is leaving the fur on the ears and tail long, but closely cropping the rest of the hair. The high-maintenance show-dog cut can be the most difficult to pull off. Fur is grown floor-length and trimmed often to maintain a length that covers the feet. The fur at this length will, of course, get dirty from your malshi's energetic romps in the park and even from getting too close to the food bowl. This style often includes a topknot of hair drawn up on the back of the head. A middle-ground style is sometimes referred to as a "plushie cut." Body hair is about 3 to 4 inches, while fur is trimmed neatly around the feet and head, making the dog look fluffy. The shorter cuts can be combined with what is called a teddy bear cut for the head. The fur on the face is cut minimally to give it a round shape with long fur. Some say this makes the malshi look like a bear cub. Maltese Shiz Tzus' faces are prone to staining from eye discharge and from food that tends to cling to their long fur. Rust, tan, or brown tear stains may appear if your dog is allergic to something in the environment or an ingredient in her food. To keep your malshi's face clean, wipe it two to three times a day with a wet washcloth or a wet wipe specially formulated for cleaning tear stains, taking special care around the edges of the eyes, and the beard, where all sorts of debris may lurk. Finally, it's time to get those feet into tip-top shape. Nails need to be trimmed about every six weeks. Once you hear them click-clacking on the floor, it's time for them to be cut. Malshis claws can be cut manually or shortened with an electric nail file. Be careful not to clip them too short, or you'll cut into the quick, a vein that runs down the middle of the claw, as this will cause your pup pain and bleeding. Some owners opt to take their Maltese Shih Tzu to a groomer for this sometimes more difficult part of canine care.